Historic bird homes made from the reclaimed cypress of a 19th century Cotton Compress building. With its beautifully simple design, and with a name inspired by a treasured historic landmark, Old Waverly brings the kind of new yet timeless tradition to your home and garden that is the hallmark of the Cotton Collection. 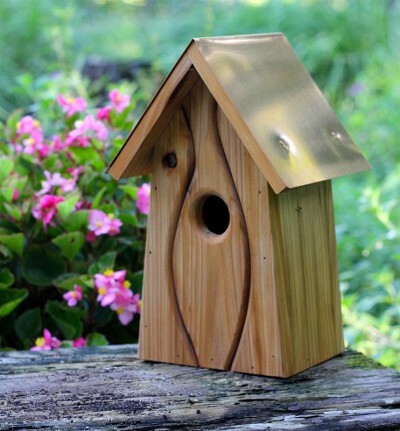 The crisp lines of the copper roof, the clean design and graceful decorative front make this house at home in any outdoor setting - and makes your birds feel at home as well, Birds dwell well at Old Waverly! Place against a wall or other vertical surface with its attached hanger. A removeable back disc make for easy seasonal cleaning. Every house in The Cotton Collection is unique - no two are alike! Each item will vary due to the texture and color of the reclaimed cypress wood. Made in the USA!